Javier Covarrubias Gonzalez is accused of giving his children away to settle a debt. (CNN) -- The words Javier Covarrubias Gonzalez used to describe the violent kidnapping of his two young children were so vivid that his neighbors and police combed the streets to find them. But the 20-year-old father actually gave his children to a woman to pay off a debt of 25,000 pesos (about $1,900), authorities said Sunday. Mexico City prosecutors said Covarrubias confessed to lying to authorities, reporters and neighbors so that his wife would not find out what he had done. Covarrubias told investigators that he had turned over his children -- along with a grocery bag stuffed with diapers, bottles and a sweater -- to a woman he knew only as "La Lupe." Investigators said the children were still missing Sunday, and Covarrubias would remain in police custody as the search for their whereabouts continued. Accounts of the kidnapping appeared on local television stations last month, and Covarrubias asked local leaders to help him pressure authorities to investigate. Reports of the kidnapping prompted protests in Mexico City's working-class Tepito neighborhood, as residents criticized police for allowing crimes in their community. Mexico City prosecutors said Covarrubias alerted authorities May 18. Ten days later, he fled -- once his story had begun to unravel, prosecutors said. Forensic investigations revealed that injuries he showed authorities as he described kidnappers violently taking his children on the street were self-inflicted. And surveilance videos showed he was not on the street where he had described the attack taking place, prosecutors said. 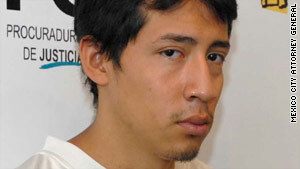 Police arrested him in the neighboring state of Hidalgo. Speaking to reporters Sunday, Covarubbias said he was sorry for what he had done and hoped authorities would find his children soon.